in a variety of people and pet pleasing colors. It's fun on the run! Soft fleece fabric covers a little safety bell so you know where your little fuzzy is when he’s not in sight. Two per package. 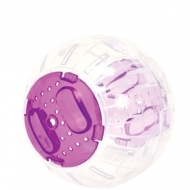 Ferrets love the jingling sound of bells and get excited batting these fun balls around. Durable plastic. Two toys per package.